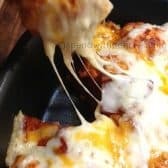 his is an awesome recipe!! Cut each biscuit into 4 pieces using kitchen scissors or a knife. In a large bowl, toss biscuit pieces, pizza sauce, toppings and 1/2 cup of cheese. Spoon biscuit pieces into a well greased 9×9 pan. Bake for 15-20 minutes or until lightly browned and centre seems cooked. Top with remaining cheese and bake an additional 5 minutes or until cheese is melted and bubbly.